We flew to Siem Reap, Cambodia next day. The flight took about an hour. My Cambodian agent, Tom, was there at the airport to meet us. 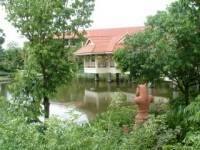 Siem Reap is a small town that exists mainly to serve the world famous antiquities and temple complexes of Angkor. Nobody could ever be disappointed by this trip. Angkor has been named one of the wonders of the world. First we checked into the Sofitel. A magnificent 5* hotel built among beautiful tropical gardens & lakes. The style is traditional Cambodian but with all the modern comforts & luxuries. It's stylish, elegant & relaxing. Next day was our full day tour of the vast temple complex, covering an area of 200 square kilometres. 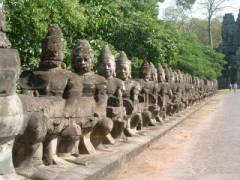 We started our visit from the South gate of Angkor Thom, visiting the Bayon and Baphuon temples, the Royal Palace and the Terrace of the Elephants. In the afternoon we headed for Angkor Wat & Preah Khan. Every temple has it's own unique beauty but the Bayon temple stands out as the most remarkable. Over 200 large faces carved on its 54 towers, each tower having 4 faces at each direction. Angkor Wat, the largest monument of the Angkor group,is an architectural masterpiece. No description can do justice to it, you just have to see it for yourself. The impressive sight grabs you right from a distance. The moment you step out of the car from the gate it takes about 10 minutes to walk to the temple, crossing the river & the parkland, leading to the steps of the temple. The magnificent temple towers above you like heaven. This immense monument occupies a rectangular area of about 500 acres defined by an enclosure wall which is surrounded by a moat. The enclosure wall measures about 3 ½ miles. It takes several hours to walk through the entire complex & the four walls of level one that still contain the many beautiful stories carved into the walls. I dreamed about visiting Angkor as a boy now I have fulfilled my dream. It met all my expectations & more, much more. I am going back again in the future. I need a few more days to see & wonder at this place. Tonight my agent Tom hosted an evening of Cambodian culture at the Chao Praya restaurant. We ate a delicious Asian buffet feast - Cambodian, Vietnamese, Japanese & Chinese dishes. The choice was marvellous. I particularly liked the Dry Steamed Fish, Chicken Curry, Deep Fried Battered Squid, Noodle Soup & Mixed Vegetables. There was also barbequed seafood & wonderful Cambodian desserts. We ate & drank Angkor Beer on the garden terrace watching a lovely dance performance on stage. It was most enjoyable & entertaining. We checked into the Princess Angkor hotel that night, a lovely & very comfortable standard hotel offering a touch of luxury. 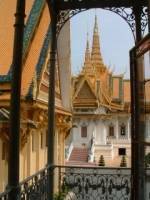 We left for Phnom Penh next day. The flight took about an hour. We checked into the standard La Parranda hotel. This small hotel stands opposite the imposing 5* Intercontinental hotel. Our city tour started from The Royal Palace, a 'must see' tour. This Royal Palace is less than half of the size of the Thai Royal Palace in Bangkok but with as much interests & beautiful architecture & gardens to enjoy. It also has a less commercial feel than Bangkok. The tour is by individual Royal Palace tour guides & ours was a young university student studying tourism. He was extremely pleasant & spoke good English. The afternoon tour was a visit to the genocide museum Tuol Sleng, the former Khmer Rouge S21 prison. This is not for anyone who does not want to see the brutal Khmer Rouge regime. It's a haunting place still echoing the pain & suffering of the many who were tortured to death. If you want to see the horrific history it is on show with pictures & displays of those periods of hell in detail. There is no 'dressing' here: its raw and powerful. The afternoon tour finished with a visit to the Killing Fields just outside Phnom Penh. Again this is not for the faint hearted. Many visitors end this visit in floods of tears. Our car took about an hour from the city centre to arrive in the countryside. A huge shrine stands at the entrance, a tall block of glass window about 30 feet high storing hundreds of skulls found here. Beyond this terrifying shrine are the remains of many big communal graves. That night we had another fantastic buffet feast in the Ton Le Sap restaurant in Phnom Penh city. Before we left Cambodia on the afternoon flight, we spent the morning shopping at the Central & Russian Markets. Both markets offers good buys for local art & crafts & some antique pieces. The markets also offer interesting sights of food, flowers, gold & jewellery, CDs etc. I did all my shopping in one morning. We left Phnom Penh at 16:00 on Saturday via KL and arrived back at Heathrow 6 o'clock Sunday morning. I had a wonderful 2 weeks trip to Vietnam & Cambodia.